The Inland Sea seen from Kenmin-no-hama Beach on Kamagari Island. 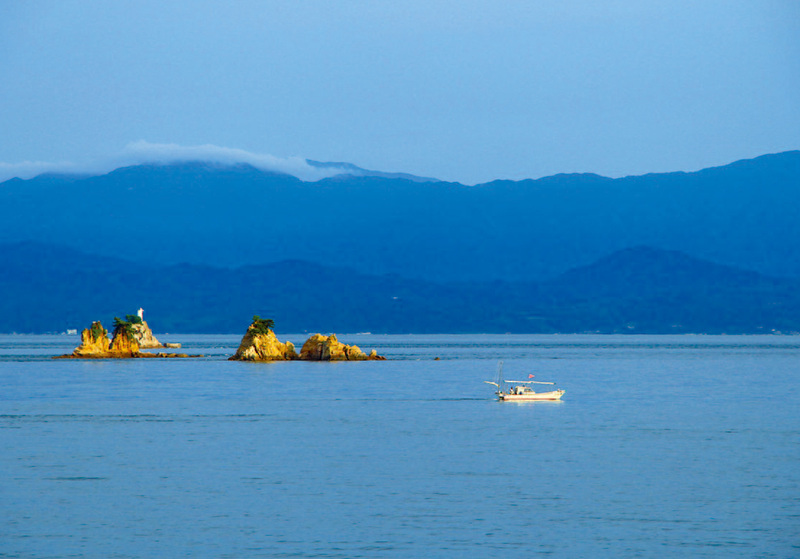 Less well-known than the Shimanami Kaido, this route allows you to revel in the beauty of the Seto Inland Sea. The view from Mt Noro, near Kure City in Hiroshima Prefecture, is constantly changing. Islands appear, vanish and reappear in the mist. Standing at over 800 metres, Noro is the second highest mountain in the Seto Inland Sea. Its slopes reach down so close to the sea that the islands look near enough to touch. In the foreground, a little green suspension bridge spans two of the islands. 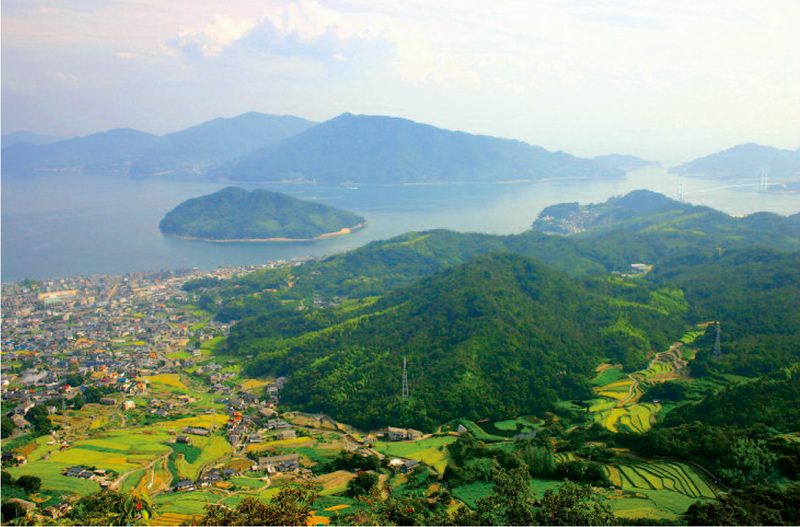 So many islands jostle together in this part of the Inland Sea that, from the top of Noro, they resemble a labyrinth. And labyrinths beg to be explored. It’s therefore pleasing to learn that many of these islands are more accessible than you might expect, thanks to Japan’s love affair with bridge building. Seven such bridges connect seven of the islands visible from Noro. Known as the Akinada Tobishima Sea Route, this stunning journey can be undertaken by car, bike, or on foot. Although less well-known than the nearby Shimanami Kaido, the Tobishima route is gaining popularity. “Currently, it’s becoming famous as a cycling course. Guest houses and cafes are also increasing,” says Yamamoto Ken’ichi of Kure City government’s Tourist Division. 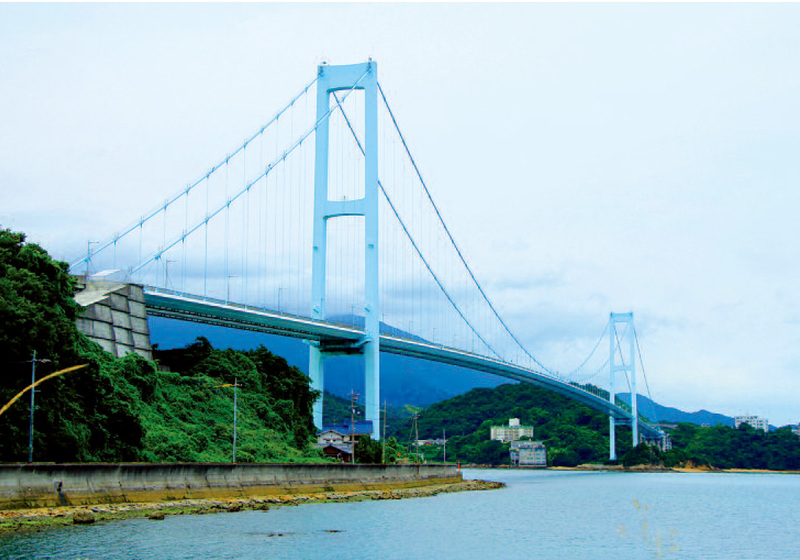 The 96-kilometre round trip runs from Akinada Bridge near Kure down to Okamura Island in Imabari, Ehime Prefecture in Shikoku. It turns out that the Akinada Bridge – the starting point for the Tobishima Route – is that “little” green bridge that was visible from top of Noro. Up close, the bridge looks huge, towering over the surrounding landscape. The Akinada Bridge (right) viewed from the summit of Mt Noro. There’s something about Japan’s sea-spanning bridges that never fails to excite. Cruising along, high above the sea, you can’t resist slowing down (if there’s no traffic behind you, as is often the case) to let your senses run wild as the sea-scented wind gushes in through the windows and the islands stretch away as far as the eye can see on both sides. More exhilarating than any amusement park ride, it’s well worth the 550 yen toll. All too soon, you reach the other side. Thanks to the bridges, these islands are no longer such remote places, but there’s still something otherworldly about them. The absence of traffic (and people), the pristine air and overall stillness make you feel like you’ve reached another place and time. The first island is Shimokamagari. Driving down off the bridge, you come to a pretty hillside garden area with splendid views of the bridge and sea. Shimokamagari is also known as the Garden Island, thanks to a project designed to make a garden of the entire island. Even the ferry terminal, with its sloping roof, looks like a temple. Shimokamagari is small, but there’s a surprising amount to see here. The island’s bucolic charm belies the fact that in the Edo Era it was an important port on the sea route connecting Japan with the rest of Asia. In the 16th and 17th centuries, Korean envoys would stop here on their way to Edo (present-day Tokyo), their lavish convoys involving scores of ships and hundreds of people. Their visits to Shimokamagari were grand affairs with lavish feasts and great ceremony. The Korean Envoys Parade, held on the third Sunday of October, still celebrates these historic occasions. The main event is a colourful procession with participants dressed in samurai and Korean costumes. The envoys arrive by boat and are carried through the streets in sedan chairs. A more permanent reminder of the island’s history can be found in the gorgeous Shotoen Garden – a seafront walk with four museums built in the Edo era style, all set in lovely gardens with pine trees, stone statues and raked gravel. It’s well worth the cost of the 550 yen toll to cross the Akinada Bridge. The museums showcase the island’s history and culture, focusing mainly on the visits by the Korean envoys. One of the documents on display – a picture scroll showing a large fleet of Korean delegates sailing through the Inland Sea – has been registered as a UNESCO Memory of the World. Other exhibits include ceramics from Japan, Korea and China and even a recreation of the huge banquet prepared for Korean guests. Today, however, Shotoen is deserted. It’s mid-July, and very few Japanese have the luxury of taking their summer holidays outside mid-August’s Obon week. And for most foreign tourists, these islands aren’t even a blip on their radar yet. As Paul Theroux said, “out of season, a place is at its emptiest, and most exposed, but also it is most itself.” True enough, today there are no cameraclicking crowds, no kids bawling for ice-cream. Just time, space and freedom to savour Shotoen at its naked best. You can’t help but feel privileged. A little further along the seafront lies the Rantokaku Art Museum. Like the other museums in Shotoen, it’s an elegant Edo-style wooden building, housing paintings by Japanese artists including Yokoyama Taikan and Hirayama Ikuo , born on nearby Ikuchijima Island. The whole street maintains the Garden Island theme with its gardens, fountains and waterwheels. Moving on to the larger island of Kamagari, it’s a pleasant surprise to discover that the Akinada Bridge is the only toll-charging bridge on the route. The rest are toll-free. If you come from October to December, you’ll notice countless roadside stalls selling oranges, tangerines, lemons and other local citrus fruits, a specialty of these islands. The stalls are unmanned – just leave your money in the tin. Another touching example of Japanese honesty. Kamagari’s main attraction is Kenmin-no-Hama Beach (literally, Prefectural Citizens’ Beach), declared one of Japan’s Top 100 beaches. Apart from great views and soft sand, the complex also offers tennis courts, lawns, a gym, pool and restaurant, as well as marine sports like sea-kayaking. If you don’t like lying on the sand, you can even rent a little tatami-floored booth with a canvas canopy to keep the sun off. Today, however, as Bob Dylan put it, “the beach is deserted except for some kelp.” It’s just a little spooky, like a ghost town, as a thousand cicadas roar in the late afternoon heat. Atop a hill overlooking the beach stands an astronomical observatory, which houses a Maksutov telescope with a 200 mm lens, one of Japan’s biggest. So far from city lights, one can only imagine what a breath-taking view of the cosmos it must offer. Pressing on, it’s impossible not to notice how overgrown everywhere is after the rainy season, which only officially ended a couple of days earlier. The greenness of the Inland Sea islands is always remarkable, but here it’s unusually effulgent. In the small town of Mitarai, on the eastern side of Yukata Island, the sun is already sinking below the horizon. Mitarai was a prosperous port in its 17th and 18th century heyday, when ships on their way to Osaka and thence on to Edo would seek shelter from storms here, or wait for the tide to change. Its narrow streets and heritage buildings with white walls, lattice doors and black roofs still preserve the charm of an old port town. But by now, darkness is spreading like an unseen hand pulling a vast curtain across the sky. Time to turn back. Little Okamura Island, the last of the seven, will have to wait for another day. The pamphlet states that the route takes 69minutes by car. That’s only if you don’t stop to admire each amazing view, take photos, or just follow your nose and explore every little nook and cranny that grabs your interest. That way, a onehour route can easily take all day. But isn’t that what travelling is all about? After all, the whole point of coming to these islands is to leave the mainland hustle and bustle behind and savour life at a slower pace.